It has been quite some time since I have written in this blog. And seeing that the last post was one where I wrote of a health scare that happened to me a couple of months ago on the Antietam Battlefield, I thought it might be prudent to write that any report of my demise is greatly exaggerated. 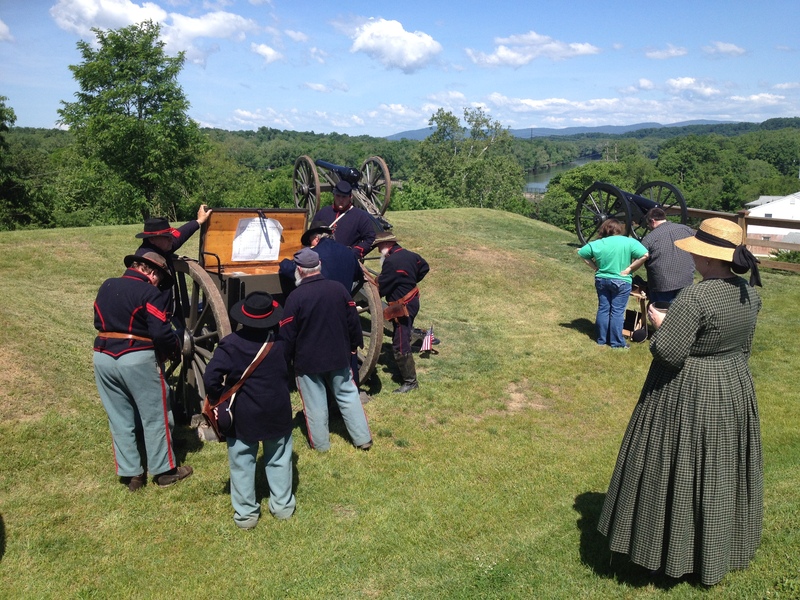 Actually, today, I spoke at a Civil War event in my home town of Williamsport – where on “Doubleday Hill” that overlooks the city and Potomac River, there was a celebration of my man Abner Doubleday and his artillery placement there in 1861. To read my previous post on that history, you may find it HERE. My talk today was on the life and times of Abner Doubleday, and it was fun to prepare for this and read the hundreds of pages of notes and rough drafts I have on the subject of this unique fellow. There was an artillery reenactment group there, and I much enjoyed and benefited from a conversation with several. And so I thought I’d share a snippet today by talking about Doubleday’s view of the Confederate General Braxton Bragg. The Doubleday quotes are from his journal materials I have found. Let’s pick up the story in 1844-45 when Doubleday was just 2-3 years out of the Academy and into his time of service at various forts, mostly along the Atlantic coast and in charge of artillery. Doubleday found himself at the regimental headquarters at Charleston’s Fort Moultrie. During these few months, he again came into association with a number of the future prominent generals of Civil War fame. Doubleday agreed with the universal opinion of William T. Sherman—that he was a genial, studious, and spirited officer. The future “Rock of Chickamauga,” George H. Thomas, Doubleday described as a pillar of the regiment; the soul of truth, honesty, and quiet good humor. The future Confederate general, Braxton Bragg, however, did not score with Doubleday on the same level, though he did merit the longer description—garnished with a number of anecdotes. While not at all lacking in military understanding and ability, Bragg was quite the critic of superiors and of the army organization in general. Doubleday said that Sarcasm was his forte. He loved to raise points with the authorities at Washington, and was saucy, even impudent in discussing them. He was so adroit at it, for a long time he went scot-free, but in the end suffered severe punishment—suspension and fine. Bragg was also very severe in his punishment, and was feared and hated among his subordinates. Doubleday tagged him as the Confederate officer known to execute more of his own men than all other officers combined. Doubleday related a most humorous story about Bragg’s service at Fort Moultrie. Bragg was for a time filling the dual positions of Post Commander and Post Commissary. There was an occasion when some tainted meat was brought before him as a complaint. An examination credited the report as true. Captain Bragg at once sat down and wrote Commissary Bragg a sharp letter saying that the condition of the beef showed great carelessness on his part. Then, on behalf of the Post Commissary, he replied to himself as Post Commander, saying that had the commander attended to his duties, the thing could not have happened. This was kept up for some time. At last, Commissary Bragg wrote to Captain Bragg that he would no longer endure the attacks upon his reputation and soldierly qualities … that he would at once appeal to the department commander for justice. The matter was referred up the chain of command, and according to Doubleday, made it to Washington before being understood as a joke. Doubleday loved a story like this and loved to share it. Posted by Randy Buchman on May 31, 2014 in Abner Doubleday. Great to see you back writing again. Thanks my friend, but I’m so swamped with life and a sports blog that I am editor for … are you an Orioles or Ravens fan? … it is http://www.TheBaltimoreWire.com … So, not sure how much I’ll get done on history.